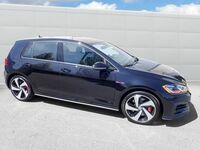 When you want the versatility of the Volkswagen Golf with enough power to put other vehicles to shame, the 2018 Volkswagen Golf GTI is your best bet. 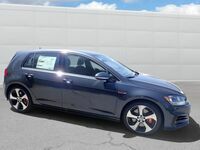 This vehicle allows drivers to have the best of both worlds thanks to a well-equipped cabin and a standard turbocharged TSI engine that has a horsepower rating of 220 and a torque rating of 258 lb-ft when paired with premium fuel. This vehicle is also the first to be made on Volkswagen’s MQB modular platform, which helps to maximize interior space and exterior strength while remaining lightweight enough to reach an EPA-estimated 25 miles per gallon in the city and 33 miles per gallon on the highway when mated to the six-speed transmission. 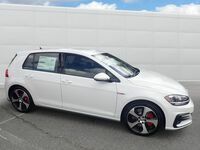 When you look at the new Golf GTI from the outside, you will immediately notice that its design and shape is muscular yet sleek, showing off with a newly-redesigned front end that is striking and steeply sloped. The front end will also see new LED lighting for 2018, with the SE and Autobahn models getting an Adaptive Front-lighting System as a standard feature. On the inside, the new Golf GTI front dash is like a cockpit of sorts, with a 12.3-inch digital display being the focal point where you can monitor your vehicle throughout your drive. 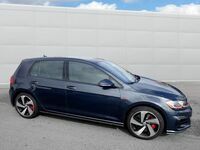 Those who want endless comfort can opt for a trim with heated leatherette seating and LED ambient lighting, while those who put more emphasis on technology can enjoy the Golf GTI's intuitive safety tools such as Autonomous Emergency Braking with Pedestrian Monitoring or Forward Collision Warning. Finally, every 2018 Golf GTI comes standard with some form of infotainment, with each system featuring VW Car-Net App-Connect with Apple CarPlay and Android Auto. 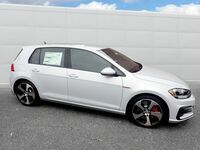 If you would like to see the 2018 Volkswagen Golf GTI in person, feel free to stop by Dirito Brothers Volkswagen for a test drive today!